Retractable fabric awnings are installed to the exterior of your house, but unlike permanent frame awnings do not require any unsightly awning framework. Using a Simu or Somfy motor, they can be extended or withdrawn with ease depending on the season or time of day. They keep your house cooler in the warm summer months, reducing the need for electricity guzzling fans or air conditioning. The decrease in electricity use will greatly reduce your energy bill. A 2007 study conducted by the Center for Sustainable Building Research found that Seattle-area homes can save 60% of their annual power usage by installing awnings. Retractable awnings can block 90% of the sun’s radiation, including harmful UV rays, while preserving your view. 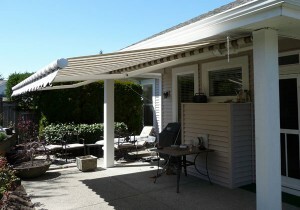 Retractable awnings look great and add an extra level of sophistication to your home’s design. Retractable awnings make it easy and reliable to entertain on your patio, limiting sunlight on hot days or keeping the rain, which inevitably will fall in the northwest, at bay. Retractable awnings can be – yes – retracted when you want to enjoy the sun. In a time of economic uncertainty and sustainability, retractable awnings are a logical investment to reduce costs, decrease your footprint on the environment and improve the look and atmosphere of your home. Eastside Awning, located in Bellevue, WA and serving eastside communities such as Kirkland, Redmond and Issaquah, specializes in retractable awnings for your home or business. We have a full line of retractable awnings covered with Sunbrella fabric and will work closely with you to make sure your retractable awning is perfect for your home.